Hitting back at Janata Party president Subramanian Swamy, a combative Congress today challenged the well-known Gandhi family baiter to move court to prove the fresh allegations he has levelled against Sonia and Rahul Gandhi, stating that the onus is on him to prove these charges. The din of electioneering in the hills died down as campaigning for the November-4 elections for the 68 Assembly seats came to a close this evening. A record number of 459 contestants, including 27 women, are in the fray with the two main contenders for power, the ruling BJP and opposition Congress, fielding candidates for all 68 seats. The Himachal Lok Morcha (HLM), an alliance led by breakaway BJP group HLP (Himachal Lokhit Party) and the Left are contesting 58 seats and have lent support to three Independents. The HLP is contesting 36 seats, the CPM 15 and the CPI 7. Development is set to suffer in Punjab. The state has barely managed to achieve 25 per cent of its Rs 14,000 crore Annual Plan target in the last seven months, even as it is looking at a Plan performance of only 50 per cent in the current financial year. Letters for de-allocation of 13 private coal blocks to their owners are likely to be sent soon after the Law Ministry gives its go-ahead, Coal Minister Sriprakash Jaiswal said today. These blocks were advised to be cancelled by the Inter-Ministerial Group (IMG) as companies failed to develop them within the stipulated time. 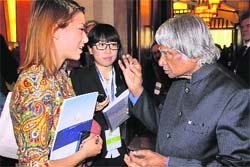 China has invited India�s �missile man� and former President Dr APJ Abdul Kalam to teach at the prestigious Peking University here, offering him a lab of his choice to work with the students. India�s premier technical institutions, the Indian Institutes of Technology (IITs), are considering a revision of the annual student fee for undergraduate courses by 80 per cent. The 15 IITs, which together have 9,618 seats, plan to increase the fee from Rs 50,000 to Rs 90,000. The agenda will come up for discussion at the upcoming meeting of the standing committee of the IIT Council, which will meet at the IIT, Bombay, on November 5 to discuss wide-ranging changes, including exemption from GATE (Graduate Aptitude Test in Engineering) for engineering graduates wanting to pursue PhD.